Receive the updates of the price trends of all monitored watches, once per week! The code engraved on the Rolex clasp let you to know the year of production of the clasp. For what we know and believe, a clasp could be one year younger or one/two year older than the year of production of the watch (to know it, take a look to the page Rolex serial number by year of production). Here it is the list of all Rolex Clasp Code from 1976 to 2010, after this period, Rolex produced its watches with a random code inside the clasp. From 1967 to 1976 the year was engraved in the clasp and before 1967, no code was engraved. The number after the Clasp Code identifies the number of month of production. 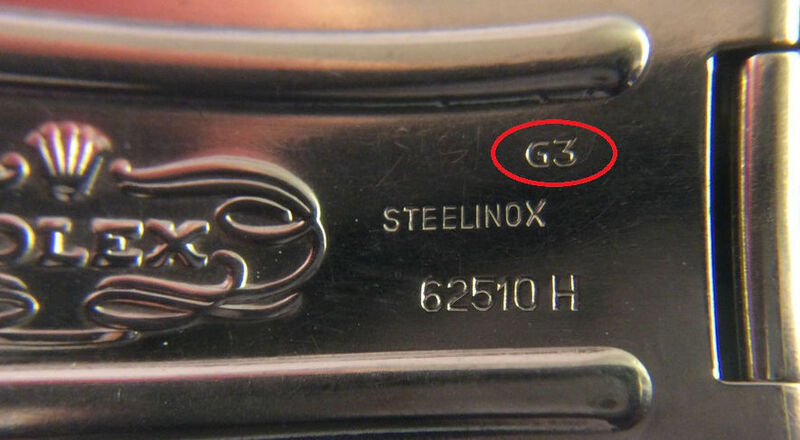 If you find an S engraved in your Rolex Clasp Code, it means that it has been changed durings a Service. If you still have the original paper of your Rolex, you can translate the Rolex Country Code. Or if it is from USA, you can learn how to read Rolex USA Guarantees. Not enough?! Take a look at our Wiki!